UNIQUE Bulkhead Plates are custom made to repair large messy holes and multiple cable penetrations in an existing firewall. UL Listed. Special Order only. UNIQUE Bulkhead Plates are Special Order items available in unlimited configurations to use with our UNIQUE Split Sleeve Firestop Systems. These are problem solvers designed to repair large holes and multiple cable penetrations in an existing firewall. Made in the USA by skilled craftsmen. See the Installation Pictorial for an example of a typical firewall violation returned to compliance using our Bulkhead Plates. 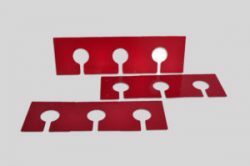 To fabricate a pair of UNIQUE Bulkhead Plates for your firewall cable installation, we will need digital photos of both sides of the wall, height of the holes, stud spacing, cable type and cable count. Click on ‘Order Now’ to access the Special Order form and send us the information we need to build your Plates. We will also include the Split Sleeve Systems to fit your installation. Or call us at 251-960-5018 for complete Customer Support. The Problem: A hospital’s fire-rated barrier the day before a JACHO inspection. Cables from multiple installers breaching the firewall. The Solution: A pair of bulkhead plates for (3) 2″ Split Sleeve Systems. A plate for each side of the wall that acts as the inside washer for our Split Sleeve Systems. Document the retrofit with the supplied warning labels. Now, bring on the Inspector!